Veggies on the grill are a great addition to any barbecue party, and these might even steal the show. Serve them next to just about anything. 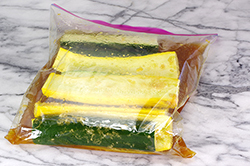 Split the squash and zucchini lengthwise and place them in a large heavy-duty zip-top bag. Add three-fourths of the marinade and seal the bag, squeezing out as much air as possible. Move the veggies around within the bag so they are well coated with the marinade. Refrigerate them for at least 2 hours, and up to 8, occasionally moving the veggies around within the bag to make sure they remain well coated. Prepare an outdoor grill to cook direct over medium-high heat. 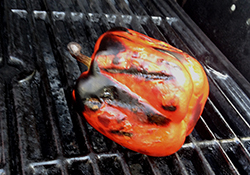 Grill the bell pepper until charred on all sides. Place in a small paper bag and set it aside to rest. 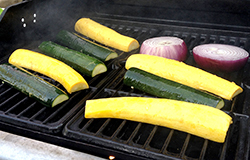 Take the squash and zucchini from the marinade and place them on the grill cut-side down. Reserve the marinade. Add the slices of onion to the grill. Cook everything for 3 to 4 minutes, until it is golden brown on the bottom. 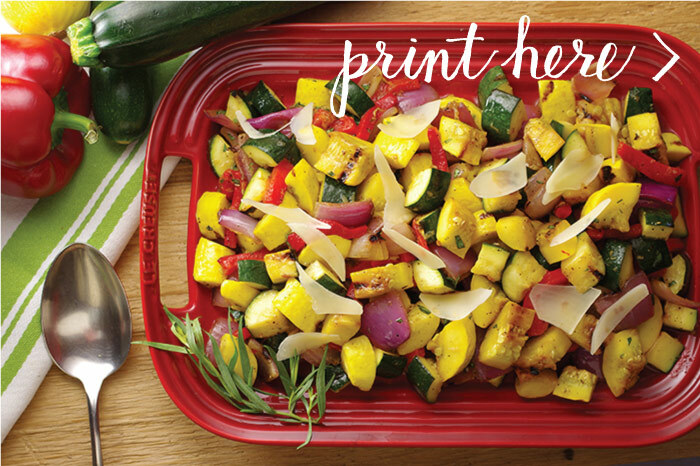 Flip over the squash, zucchini, and onion and cook them for another 3 to 4 minutes, until they are golden brown on the bottom and just tender. 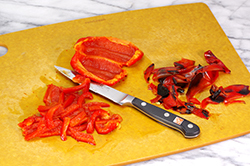 Remove everything to a cutting board. 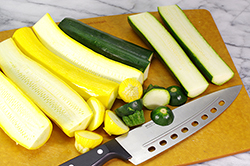 As soon as it’s cool enough to handle, cut the squash and zucchini into bite-size pieces. Chop the onion. Peel the charred skin from the bell pepper. Core, seed, and cut it into 1-by-1/4-in (2.5-cm-by-6-mm) strips. 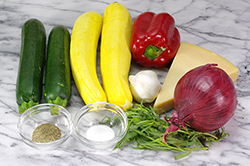 In a large bowl, combine the squash, zucchini, onion, bell pepper, garlic, tarragon, 1 tsp salt, pepper, and the reserved marinade. Toss it all well to mix. Taste for salt and add more if necessary. Transfer the mixture to a shallow serving bowl and top it with the Parmesan before serving. 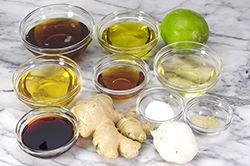 Inspired by a dish I created for a dinner with the Graham Rahal Indy Car Race Team, this recipe is a tasty and fun marinade that easily doubles as a salad dressing. In a medium bowl, combine the sesame oil, agave nectar, olive oil, ginger, vinegar, fish sauce, soy sauce, lime juice, garlic, salt, and pepper. Whisk vigorously until they are well blended. This may be made up to 12 hours ahead and keep covered in the refrigerator.